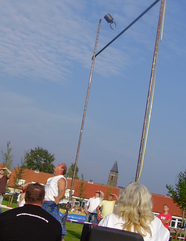 December 8 - Wout Zijlstra, the legendary athlete of the Netherlands, holds still the masters records in the Netherlands for the Weight for Height. His WOB with 56 lbs is 5.30 meters (17'39") and his WOB with the 42 lbs weight is 6.10 meters! (20'01"). Both distances are still world class. Also his Braemar stone is still a standing masters record for the last few years. December 9 - Michael Dickens, World Champion 2011 Calgary in the 40 -44 class is defending his ttile next year in Greenville (USA) during the Masters World Championships 2012.